Create your own wearable glass art! At Wired On Glass, we are excited to offer you the opportunity to create your own distinctive glass art earrings, pendants and bracelets from borosilicate (boro) glass beads and sterling silver findings that have been handcrafted in our studio overlooking Kootenay Lake, in beautiful Nelson, British Columbia, Canada. 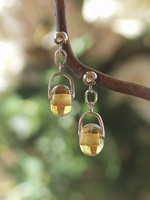 Begin by picking your favorite style from our unique selection of sterling silver earring designs and then complete your earrings, pendant or bracelet by choosing from our wide variety of beautiful handcrafted borosilicate glass beads. 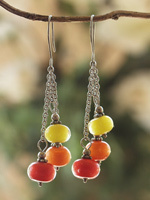 Each of the lampwork beads used in our jewelry is also made in our studio. We then put it all together and create for you unique custom crafted glass art earrings, pendants or bracelets. Let us create a pendant to match your earrings – from colors to complement any item in your wardrobe! 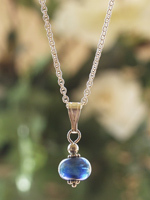 Do you need a silver chain for your pendant? Our pendants will also slide onto most chains. Either way we can supply the pendant only or complete the set by providing the chain as well. 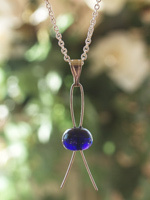 You pick the style of pendant, the style and length of chain and we will put it together for you. Would you like a matching bracelet? Choose from several styles. You choose the beads, provide your wrist size, and we will create a beautiful custom bracelet unique to you. Perhaps you would like earrings, pendant or bracelt more personal and unique to you. Send us your ideas and we will let you know if we are able create the jewelry for you. Customized, handcrafted wearable glass art is what we do!